On September 26, 2005, this web site received from Bill Dory, son-in-law of George Motchan, an e-mail referring to the 30th anniversary of the slaying of C.O. Motchan by an escaping inmate. The message is replicated below. 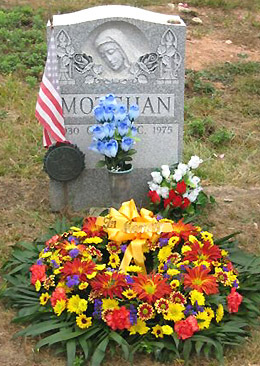 Flowers on the grave of C.O. George Motchan September, 2005. SEPTEMBER 26, 2005 -- This month was the 30th anniversary of my father-in-law's death. I was contacted by Kevin Calabrese who is the head of a retired COs organization. He had worked with George at Kings County Hospital Prison Ward. He said that he and some other retired COs who had worked with and were friends of George would like to put flowers on the Grave. I remember Kevin and some of the others; they were good friends of my father in-law. Retirees with George Motchan widow and daughter at grave. I send you two pictures from the cemetery and a third picture taken under the Motchan street sign, which they had never seen or even knew about. 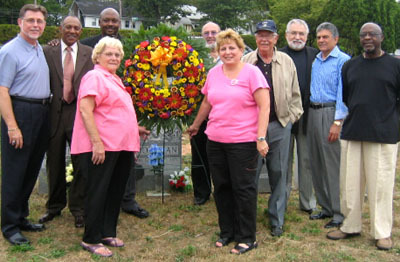 The names of the men in the first group picture are from left to right: Kevin Calabrese, Robert Smith, Dave Sanchez, Anthony Noviello, Rudy LaPolla, Paul Corrao, Joe D'Angelo, and Ray Bryan. In the front row are: CO Motchan's widow Dolly Motchan and his daughter Kathy Dory, my wife. 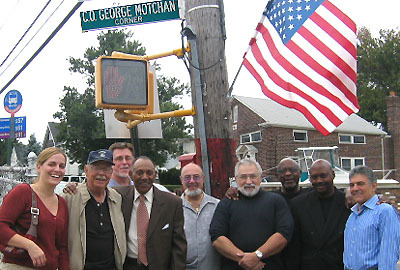 Motchan granddaughter Kelly with retirees beneath street sign. The girl in the street sign picture is my younger daughter Kelly Dory. Kelly decorates the street pole every holiday. I thought it would be nice if at all possible to include the pictures on the web site. . . .